Head to Alameda for the down-home flavors of Hawaii, Vietnam, and the American South. Hang Ten Boiler is the very definition of a casual restaurant. Hours: Mon.-Fri. 11 a.m.-3 p.m., 5-9:30 p.m., Sat.-Sun. 2-9:30 p.m. I haven't been shy about my fondness for unlikely culinary juxtapositions: for Mexican pollo as prelude to American pie, for bulgolgi dished up with a side of hash browns, for obscure international street foods served at gas stations or in the back of some bar. Then there's Alameda's Hang Ten Boiler, a restaurant that brings together two cuisines — Hawaiian and Asian Cajun — that both embody this kind of cobbled-together patchwork of the American immigrant experience. Hawaii is, of course, a melting pot of Eastern and Western culinary influences: Polynesian, Japanese, Korean, Filipino, and plain-old American. 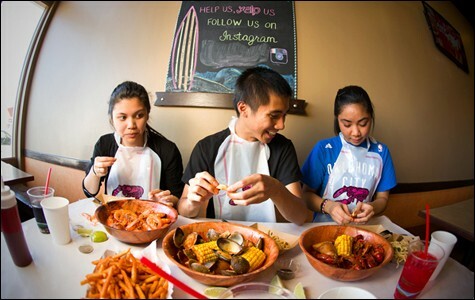 Asian Cajun cuisine, on the other hand, is the invention of Vietnamese immigrants who settled in Louisiana and applied their own sensibility to the traditional Cajun crawfish boil — a style that in this past decade has translated into a crop of successful restaurants opened by Vietnamese Americans, mainly in Southern California at first. 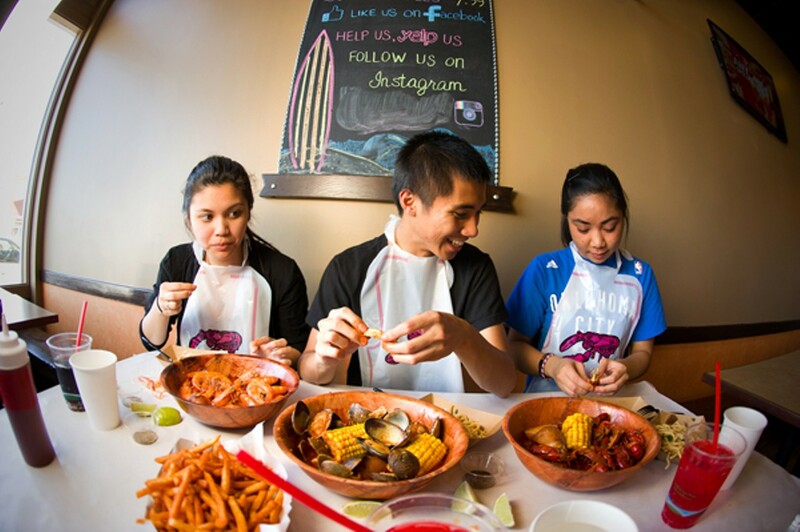 Here in Alameda, Paul Wong ran a branch of Hawaiian Drive Inn, a local Hawaiian barbecue chain, until this past February, when he decided to rebrand the restaurant, adding the seafood boil element. Instead of ditching the Hawaiian theme altogether, he thought, why not serve both cuisines side by side, so that carnivores and seafood lovers could feel equally at home? (Sorry vegetarians: This isn't the place for you.) And so, Hang Ten Boiler was born. In a certain sense, it's the "fusion-iest" restaurant in the East Bay. The Asian Cajun part of the menu is short and simple: Boiled shellfish, ordered by the pound, comes in plastic bags filled with your sauce of choice, set to your preferred level of spiciness. I recommend the Manila clams with the garlic butter sauce, no extra spice added. When the clams are fresh and plump, as they are at Hang Ten, you don't want anything to distract from that perfect union of briny clam liquor and lush, garlicky butter. Other sauce options include lemon pepper and (less conventionally) curry. But most tables opt for the signature "Hang Ten" sauce. Every Asian Cajun restaurant has its own secret blend of spices, but as far as I can tell, they're all made from more or less the same stuff: butter, garlic, cayenne, a premixed Cajun spice blend, and a squeeze of lemon juice. Hang Ten cooks its sauce down to a thicker-than-usual slurry — the better for dunking. And the spice levels are more easily customizable than at other Asian Cajun spots, where even "mild" often reaches the upper limit of my spice tolerance. Here, the "medium" was just hot enough to clear my sinuses. All in all, the seafood was fairly high-quality. Wong said he hand-selects live crabs at the market each morning, and the crawfish, flown in live from Louisiana every day, had more meat than most — each one a mini lobster tail of sorts — and none of the mushiness you get with less-fresh specimens. With both the crawfish and the shrimp, the heads are the very best part — intensely liver-y, earthy, and pungent. Don't knock it if you haven't tried it. As with any crawfish boil, sausages, potatoes, and corn are available as add-ons. But you'd be better off ordering a side of buttery, Vietnamese-style garlic noodles or Filipino lumpia (crispy little cigar-shaped egg rolls). Either one will offer your taste buds a nice change of pace. Better yet, get a basket of the fried catfish, a version that would please any soul-food lover: crunchy, well-seasoned cornmeal batter and perfectly moist flesh, with none of the muddy flavor you sometimes get when catfish isn't prepared properly. The Hawaiian half of the menu is mostly a holdover from the restaurant's Hawaiian Drive Inn days, though Wong has tweaked things here and there. I'd skip the so-so Spam musubi and the various permutations of teriyaki. The Loco Moco — hamburger patties served over rice and topped with fried eggs and brown gravy — is more intriguing, and more classically Hawaiian, but isn't available during dinner hours. We settled on the Kalua pig, which traditionally is a whole pig roasted outdoors inside of a dirt pit. Hang Ten does a credible version on the stovetop: tender, five-hour-slow-braised, liquid-hickory-smoke-infused pork shoulder. Served with stir-fried cabbage over a big mound of rice and a scoop of macaroni salad (heavy on the mayo, light on the vinegar), this was a stellar example of the Hawaiian lunch plate — a self-contained meal, and Hawaii's answer to the Japanese bento. Already, Hang Ten seems to be one of the most popular restaurants in Alameda. On weekends, you might encounter a 45-minute wait at dinnertime, even when you've called ahead to put your name on the list. For a tiny restaurant, there are a disproportionate number of parties of eight or more. It's easy to see why. Wong, a Bay Area native, isn't Hawaiian or Vietnamese himself. But he's taken to the cuisines, and to the hodgepodge of uniquely American cultures that they come from, with the zeal of a late convert. He and his wife, Mai, who runs the front of the house, have created a fun, family-friendly place where the food is tasty and inexpensive and comes out quick. But what he talks about, more than anything, is his desire to create a place where Hawaii's "aloha spirit" and good-old Southern hospitality can intersect. That, I think, is a kind of fusion that most diners would be willing to get behind.